Give your home a beautiful look with this classic exquisite Silk Rug from India. 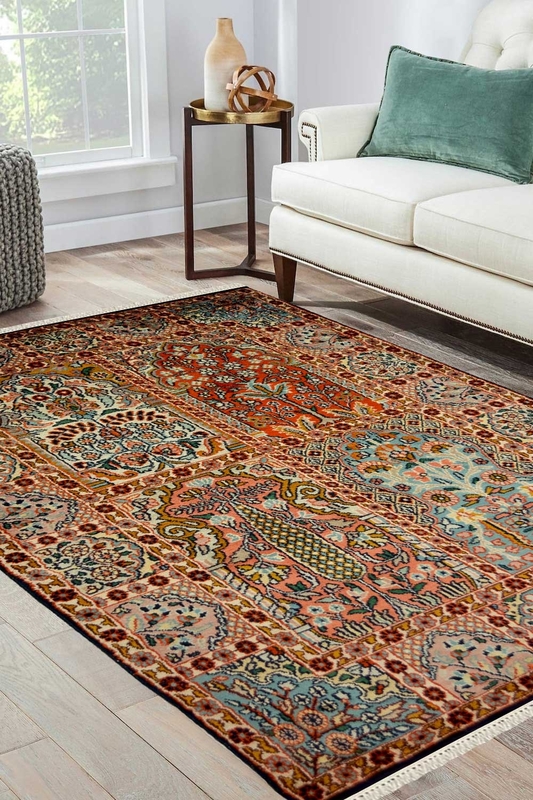 With the amazing Hamadan design and use of vibrant colors, this silk rug from India can become the most beautiful addition to your interior collection. Bring home an experience of royal traditional handicraft art with this Hamadan designed pure silk on a cotton rug from India. The superfine Kashmir silk thread are woven together with a touch of Persian design. This is a perfect piece to give a magnificent, an elegant yet royal look to your decor. It is beautifully woven in Hamadan design which has been originated from Iran in 16th century. This carpet contains four equal size boxes on the ground of carpet and each box contains different design.